Online interactions have changed the ways people participate in politics. The second in our series on social media and the transformation of society. The facebook page of “My Stealthy Freedom.” Credit: http://wayvs.com. Some rights reserved. Ever since pioneer feminist Carol Hanisch published her groundbreaking piece ‘The Personal is Political’, feminists around the world have used the motto as a mantra to highlight the important role personal development can play in motivating activists and sparking social change. This is especially true for young minorities, who often feel isolated until a key moment provides an opportunity to identify with a larger collective that was previously unknown or deemed unimportant. Personal empowerment is an often-overlooked prerequisite for political action. Coming to the realization that there is something wrong with your situation motivates you to do something about it. But often people in small, isolated communities can’t pinpoint or articulate exactly what that is until they encounter others who feel the same way. Since Internet use exploded in the industrialized world fifteen years ago, social media have been the key platforms on which more and more people have developed their own identities and connected with likeminded individuals outside of their immediate surroundings - people who make them feel less alone and more empowered. But do online activities really help activists to advocate for rights and causes more effectively? Are there limits to the Internet’s ability to aid people in transforming their personal narratives into activism that effectuates important societal transformations? Because it permits people to showcase their identities from the safety of their own homes, the Internet has become a catalyst for identity politics, and consequently, for the political organizing that goes with them. Young people of all kinds frequently use social media to connect with others with similar beliefs, values and lifestyles, but for some these interactions take on special meaning. Young people who identify as lesbian, gay, transsexual, bisexual, or queer (LGTBQ) provide an important example. LGTBQ adolescents often face harassment, stigma, and isolation in their local communities. But the Internet has proven capable of ameliorating some of the negative impacts of homophobia by providing access to friendship, support, information, romantic partners, and a sense of community. According to a study published in the Journal of LGTB Youth, young people from the LGTBQ community are far more likely than their heterosexual counterparts to seek support from others online. In the sample surveyed, four out of every five gay young people had exclusively online friends, compared to one in five of their heterosexual counterparts. Relying exclusively on online connections can be dangerous, but some of these relationships eventually form part of successful social movements that go on to win important battles. One recent example is the movement that succeeded in ending a ban on the membership of gay youth in the Boy Scouts of America. According to their own website, the Boy Scouts is an organization that encourages young men to build confidence by meeting new challenges and making friends. But since its inception the group has banned openly gay members from joining. This means that some young men who participated in the Boy Scouts from early childhood had to hide their sexual orientation, or risk being expelled from the group. Being banned from a youth group may not seem like a life-altering problem, but the Scouts Associations (girls and boys) often represent a staple of growing up in America. Over 2.6 million young people between the ages of 10 and 18 are currently members, so being excluded from participating could have a harmful impact, especially on those who live in areas where other opportunities for social interaction are limited. This is especially true if the person’s youth was defined by the connections they made in these groups during early childhood. But openly campaigning for the inclusion of gay youth proved difficult for members of an organization that receives funding from conservative, Christian institutions from across the country, and which boasts a miniscule number of openly gay members. Online petitions allowed people to express their opposition to the ban and join forces with equality activists who otherwise they wouldn’t have been able to reach. After an Ohio-based “den mother” named Jennifer Tyyrell was forced to out of the Boy Scouts due to her sexual orientation, she launched the first online petition, and the movement quickly took off. Backed by two million activists and 124 petitions, the Association’s board members were forced to take a stand against the ban. Such rapid growth and widespread reach would have been impossible were it not for social media. Sexual minorities are not the only group to organize online. People who have made the difficult decision to leave the closed, conservative religious groups in which they were born have also turned to the Internet for comfort, companionship and collective action when their traditional communities have shunned them. Take the “Hassidim,” for example, ultra-Orthodox Jews who have settled in New York and elsewhere and who live largely in isolation from secular society. Men spend most of their days studying the scriptures, while women take care of the family. But access to social media allows younger Hassidim to question their secluded existence. The Internet makes the secular world more accessible, and offers a glimpse of different lifestyles. Subsequently, this exposure can lead individuals to question the validity of the traditional values that have been foisted on them. In fact, fear of the Internet’s influence is so strong that many community leaders have attempted to ban those in the ultra-Orthodox community from accessing it. Deciding to leave this community can also be exceptionally difficult. “They are like aliens”, claimed Irit Paneth a member of an organization called Hillel, which offers practical help to former members of the community. Many of these support groups are organized online, like Footsteps in New York, and Unpious – a website that offers those “on the fringe” of Hassidic life the opportunity to share their stories without having to meet in person. Another example comes from the work of Franka Hummels, a Dutch freelance journalist and activist who experienced the effectiveness of online mobilization after a protest party she had planned met with unexpected success. Hummels organized a face-to-face lunch meeting with a group of female activists she had communicated with via Twitter, but had never met in person. During the lunch, she happened to read an article on her smart phone reporting that Eastern European immigrants were being brutally lambasted by far-right Dutch politician Geert Wilders for being “noisy and drunk in public.” She shared the piece with her lunch guests and they decided to throw a party in solidarity with Eastern European immigrants in the Netherlands. But they needed to find more people to get involved. In fact, according to media advertising specialists, news of the party and its messages eventually reached between three and five million people. The Internet allowed Hummels and her friends to organize an event that challenged the negative stereotypes spread by Wilders in the media – a great example of combining online and offline activism. Personal connections made through social media make possible what American journalist Marc Dunkelman calls “outer-ring” relationships, or long-distance bonds that are linked by a common cause. Without these relationships, widespread, non-hierarchical social movements such as Occupy Wall Street or the Arab Spring would have been impossible to implement. Online interactions have changed the ways in which people experience politics, and how they organize to build a world that more closely resembles their visions of societies transformed. And as online relationships blend with offline political activities, the personal becomes increasingly political. Political movements rely on people working together collectively, and in the future, these collectivities will be brought together through online interactions and personas. Internet activism has now become so common that many artists and activists don’t think twice about showcasing the most personal aspects of their struggles without embarrassment or shame. Award winning transsexual photographer Wynne Neilly, for example, raised awareness about transsexuals by documenting his own female to male transition for the world to see online. More recently, the Twitter hashtag #Fatkini went viral as thousands of women shared photos of themselves in their bikinis to tackle body shaming and encourage a healthy body image. 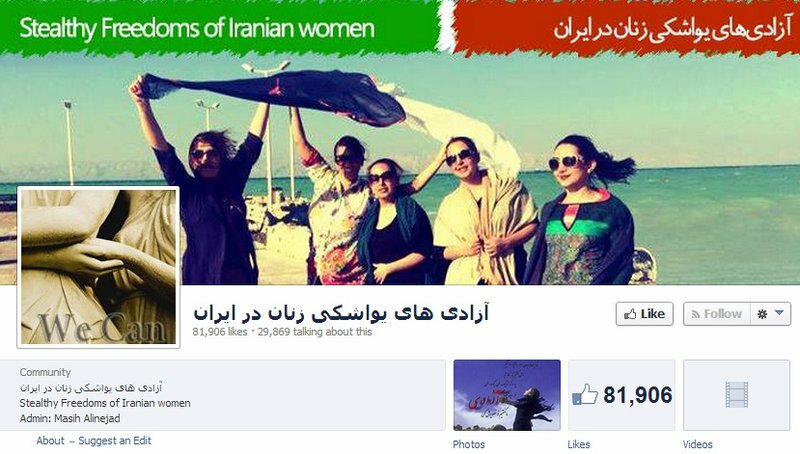 Similar numbers of Iranian women joined the My Stealthy Freedom movement by posting pictures of themselves online without the government-required hijab. None of these campaigns would have been possible offline, partly because of the difficulty of physically organizing large numbers of people quickly, and partly because the women involved in Iran would have faced political persecution had they removed their hijabs in a real public space. Today, the average person in the USA spends more time online than watching television, and statistics from other industrialized countries are comparable. This gives Internet activists an unprecedented opportunity to reach larger audiences. People now use online methods to mobilize everything from mutual support groups for minorities to protest movements for social justice and equality. While online relationships may be a poor substitute for the emotional warmth of a face-to-face interaction, they are quickly surpassing community gatherings in their ability to reach huge numbers of people quickly. Those qualities are going to be important in any broader effort to transform society.